When it was time for her to go to college, she studied art at the California College of the Arts in Oakland. She started off as an illustration major and then eventually fell head over heels in love with metalsmithing. Currently, Shun works as a teaching artist at the Honolulu Museum of Art School, helping Young Artists aged 14 to 18 find their inner Paloma Picasso or David Yurman. 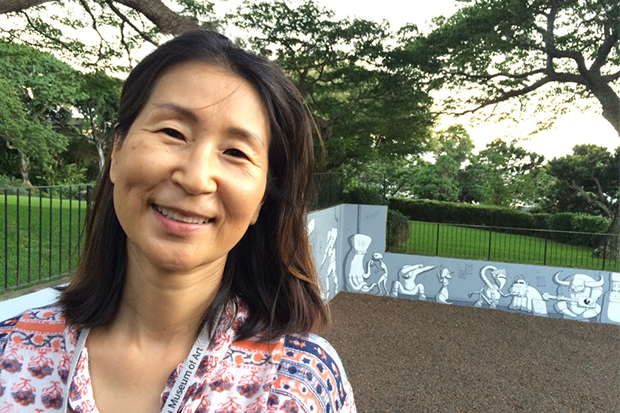 We caught up with Shun to learn more about how she started at the museum and her favorite moments as a teacher. How did you get involved with the museum as a teaching artist? I found my job through an online ad. The Honolulu Museum of Art was looking for an outreach program art instructor. I applied and was subsequently interviewed and hired by former school programs manager Pearlyn. I was absolutely thrilled to be chosen. Later, I asked Pearl how many people had applied to the job. She replied, “Only one,” which I found funny. As the years have gone by, I have learned an immense amount and have fallen in love with teaching art. What is one of your favorite memories as a TA? While teaching at one of the outreach schools, I encountered a student who refused to draw. I tried my best to encourage him to draw just one line—I practically begged at times. His classmates caught on and all aided in encouraging him. On the last day of our art sessions, this student was the first to proudly finish his drawing project. I was stunned by how beautiful his finished pieces were. Wow. It was an amazing transformation. I experienced the power of art education! Who are some artists you admire right now? I have always been interested in kinetic art, so I spend a lot of my time learning about it. There is one Dutch artist in particular whom I admire—Theo Jansen. He is well-known for his Strandbeests—slightly eerie, yet gorgeous, walking kinetic sculptures. Hannah creates beautiful detailed works in silver and is a dedicated metals teacher. It is interesting to read that she got her inspiration from her parents. One interested teacher can chance the life of a child forever. It is apparent that Hannah has influenced the lives of many of her students with her caring and thoughtful approach to teaching art.